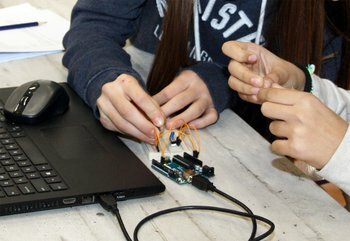 STEAM - Science, Technology, Engineering, Art, and Mathematics - is an interdisciplinary, project-based Academy course that fosters creativity, design thinking, and computational thinking and enhances students' data literacy. A novelty of the course is that students are introduced into Machine Learning, Artificial Intelligence, and Internet of Things that are integral to the rapidly changing data-driven economies and societies of today. Within the course students can either work collaboratively to complete projects or pursuit their own innovative endeavours, indicatively: robotics, space experiments, predictive statistics, computer vision. STEAM takes place in the Incubator's space, Learning Commons.